Scientists from the Rosalind Russell Medical Research Center for Arthritis (RRAC) teamed up with the UCSF Planned Giving Program to present a luncheon on Oct. 30 to increase awareness of UCSF�s leadership in the field among estate planners. RRAC Director Ephraim P. Engleman, MD, immunologist/rheumatologist Arthur Weiss, MD, PhD, rheumatologist David Wofsy, MD, and RRAC board member L. Holly Smith, MD, shared their insights. The support of the RRAC, they say, has spurred significant progress. Weiss reported on the role of genetics in autoimmune diseases, specifically on the research of genetic epidemiologist Lindsey Criswell, MD. In September, the New England Journal of Medicine published her studies, part of a multicenter study, which identified a critical gene that increases a person�s risk for rheumatoid arthritis and systemic lupus. In Weiss� own lab, he and his team are altering genes in mouse models to identify which combinations of genes lead to lupus. �By understanding the combinations that lead to lupus, maybe we�ll have better targeted therapy,� he said. �Over the years, tremendous progress has been made in immunology and biotechnology,� said Wofsy, �which has helped us to understand the chain of events that causes inflammation, pain and joint destruction in patients with rheumatoid arthritis.� In the late 1990s, UCSF contributed to a major breakthrough in development of a drug for rheumatoid arthritis. Now, Wofsy is involved in running clinical trials of several therapies for systemic lupus, and has high hopes that at least one will be effective. �I think soon there will be the first biologic therapy in lupus. It�s a very exciting time,� he said. The US Congress created the Rosalind Russell Medical Research Center for Arthritis, which was awarded to UCSF in 1979. 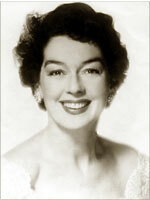 The center is named after actress Rosalind Russell, who developed rheumatoid arthritis in the 1960s. Frustrated that doctors knew very little about arthritis, she successfully lobbied Congress to pass the National Arthritis Act. After she died, the center was established.